Something exciting has been happening behind the scenes with Simple Life Pattern Company and Sew Caroline! 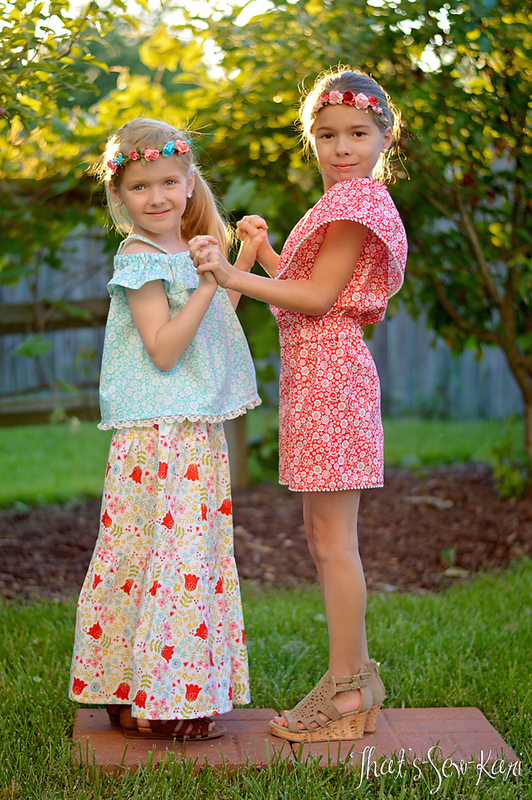 They teamed up and swapped patterns to upsize (SLPco) and downsize (Sew Caroline) for Mommy & Me sewing. I love sewing for my girls (they are so appreciative) so I chose to try out the Sugar Pop Top and the Magnolia Shorts. I was also lucky enough to shop some of the Riley Blake Designs collections and pick out some fabric! Yay!! I love Riley Blake. I chose to order from the Juxtaposey line by Betz White. 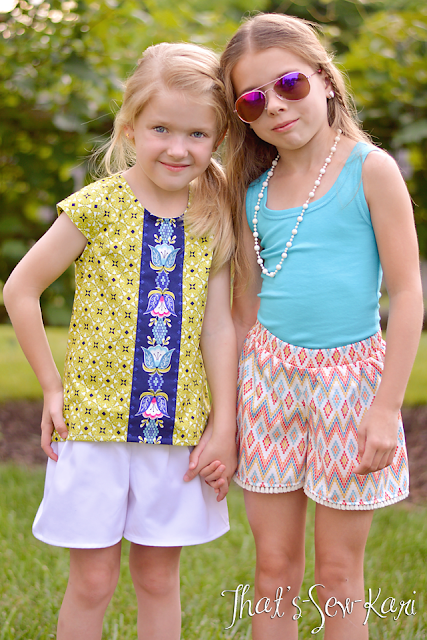 I chose Stripe (navy) and Star (green) for the Sugar Pop Top and Diamond (white) for the Magnolia Shorts. I love that my girls can coordinate from the same line without being completely matchy-matchy. The Sugar Pop Top is such a sweet blouse for summer. It has both cap sleeves and flutter sleeves as well as a hidden button placket in the back. 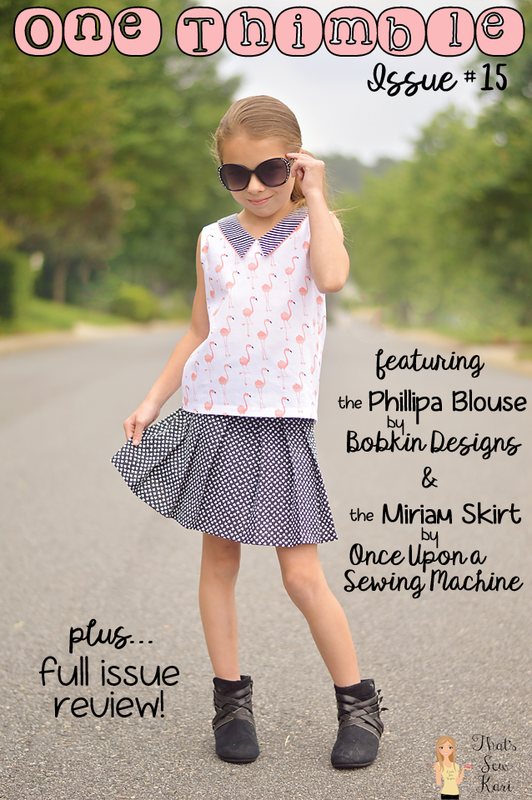 It also includes a peter pan collar and a slight hi-lo hem. The inside is unlined so it's not too hot for the summer heat. Both the collar and arms are finished off with bias tape for a neat and tidy inside! In lieu of the peter pan collar, I chose to add in a feature stripe of Juxtaposey Stripe (navy). I just love the contrast against the green Juxtaposey Stars. As I was getting my "back view" to show the hidden placket, she turned and smiled. Here's my "not-so-hidden" hidden placket because I apparently got distracted by the cute smile and didn't have her turn back around. 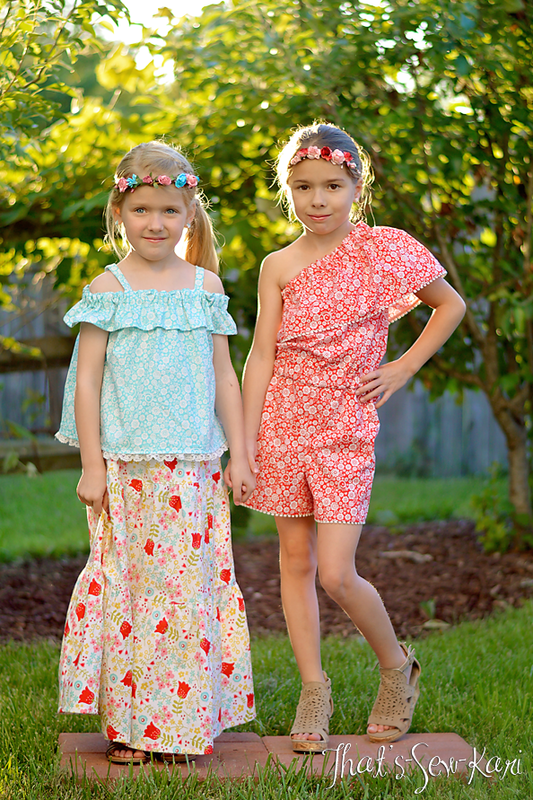 The Magnolia Shorts are a super quick sew with either an elastic or knit waistband. They are a relaxed fit. I added a fringe trim from Hobby Lobby to the bottom of this pair. A special thanks to Riley Blake Designs for sending this awesome fabric my way and to Sarah of Pattern Revolution for organizing the tour. 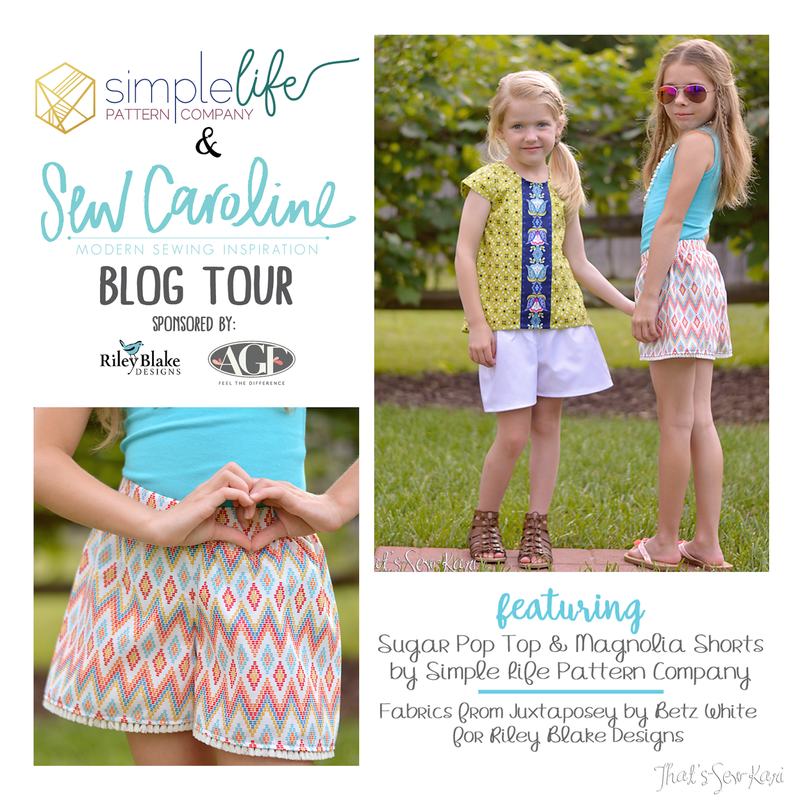 For more Simple Life Pattern Company and Sew Caroline Blog Tour inspiration, visit these stops along the way!! Eeeks!! 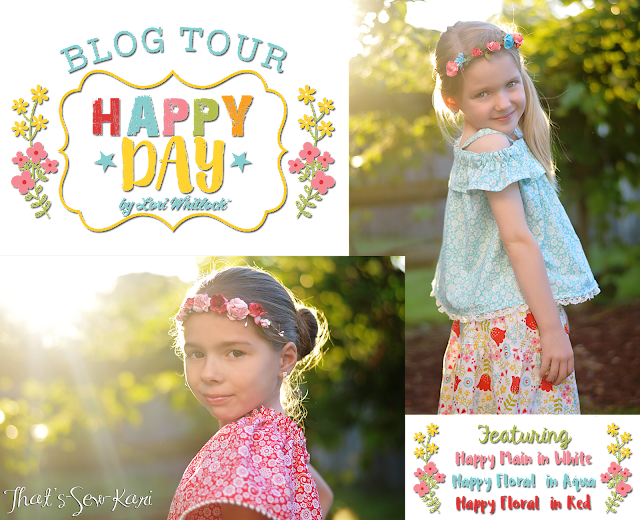 I am so excited to be on tour with Lori Whitlock and Riley Blake Designs to show off Lori's latest line, Happy Day! 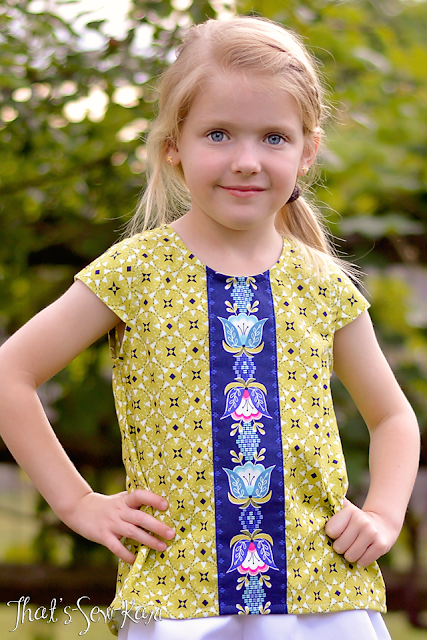 This gorgeous line is full of color, flowers, kites, butterflies and charm! These fabrics instantly make you smile. As I browsed the fabrics selections, Happy Main in White caught my eye along with Happy Floral in Aqua. I had visions of a maxi skirt and summery top. 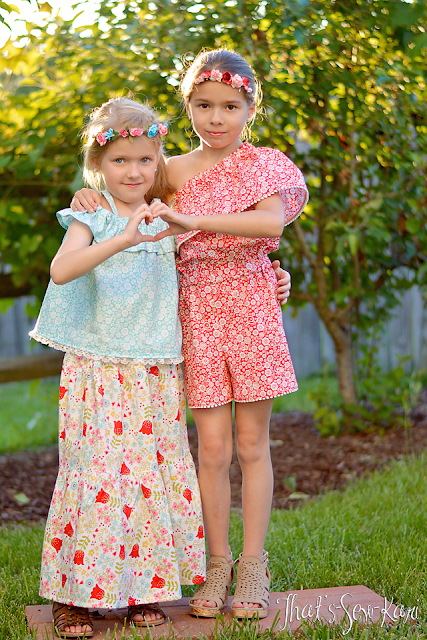 While I sometimes choose between my girls for whom I'll sew, I thought the Happy Floral in Red would make a cute coordinating romper. All three patterns are from the Breeze Collection that released this Spring at Little Lizard King. My 6 year old has developed a recent love for maxis. I used the Mayari Skirt in a 3 tiered maxi length which showcases the main print really well. 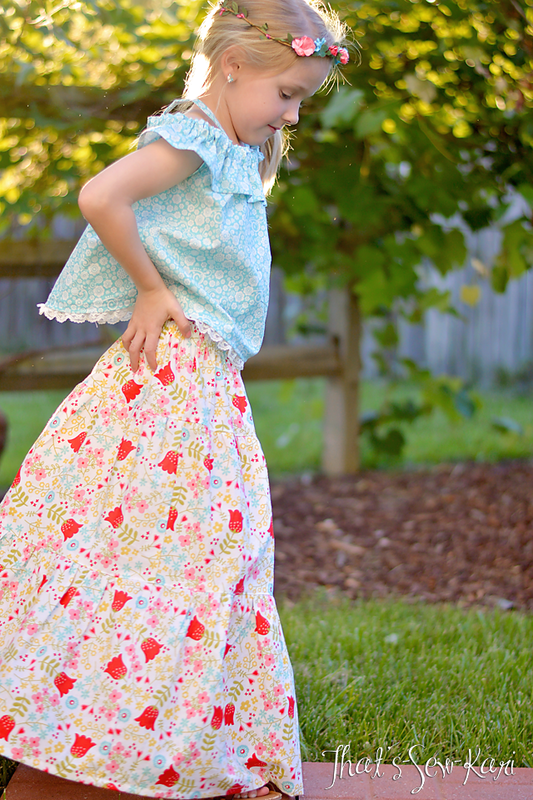 The skirt also comes in a 5 tier which is a bit twirlier (shhhh, don't tell my daughter) which would be perfect for mixing several prints from the Happy Day line. My little blondie has gorgeous blue eyes which I love to accentuate by choosing a blue hue for the top. 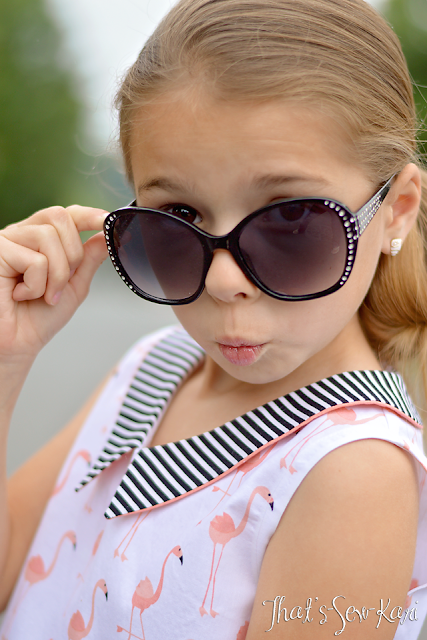 The Happy Floral in Aqua is almost a perfect match for her peepers. 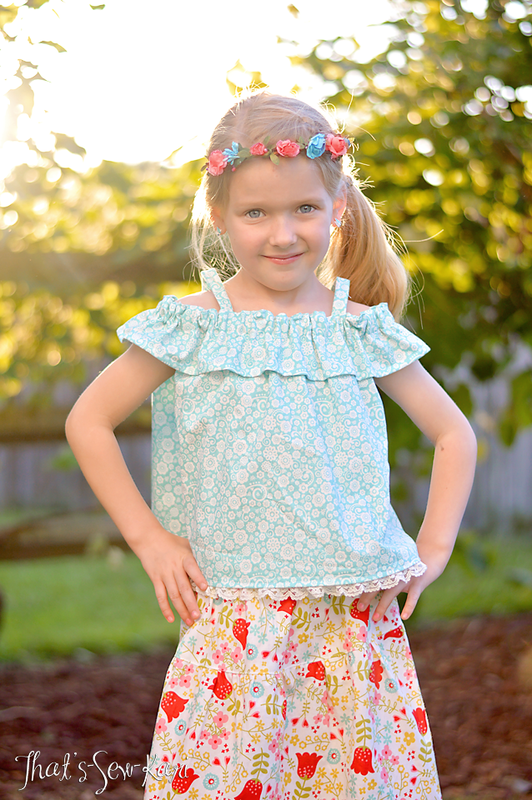 It sewed up so beautifully in the Isla Top by Little Lizard King. 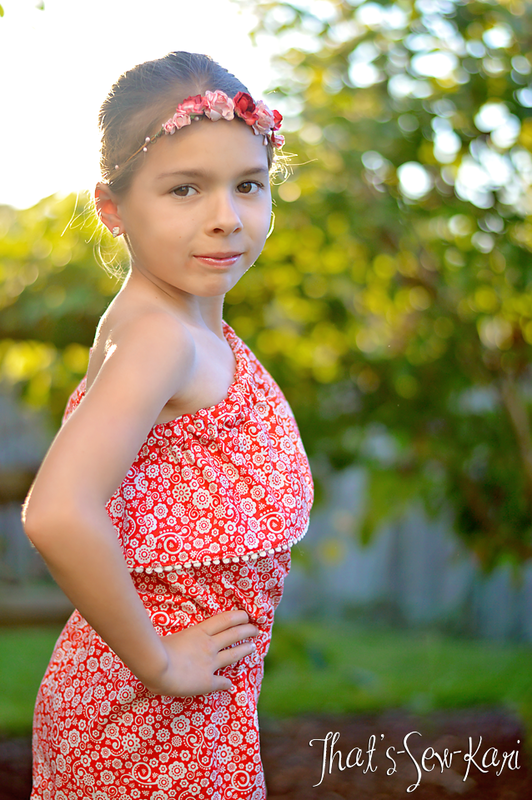 My 8 year old is at that age where she needs to feel cool, especially to wear handmade. I turned to the Havana Romper by Little Lizard King. 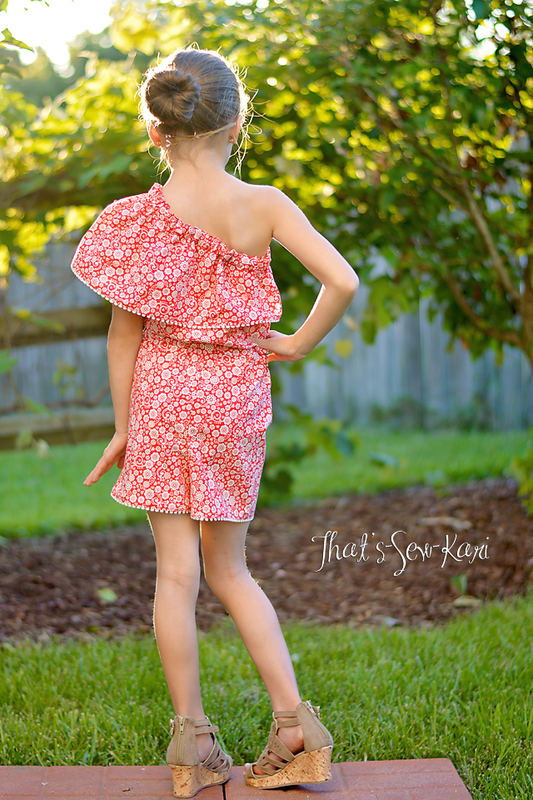 It was my first romper I've ever sewn, if you can believe it, and my daughter is in love! She felt very fancy and the Happy Floral in Red complimented her skin coloring and chocolate brown eyes. I added mini pom pom trim for added detail. We had a little photo shoot in our new backyard where we have spent many happy days since making the move! Thank you Lori Whitlock and the Riley Blake Designs team for the invitation to tour with you and to be a member of your Contributor team. I feel so very honored and blessed to showcase your fabrics. There is nothing but love from my girls and I for your fabrics! In case you have missed any of the other Happy Day Tour stops, be sure to visit! One Thimble releases are always a welcome sight and Issue No. 15 is definitely a WOW! 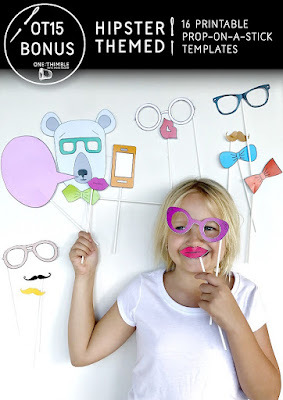 The theme this time is Preppy Hipster and boy-mamas, this issue is packed with patterns for you! Of course, there is plenty for the girls too! Just check out the cover -- ahhhh-mazing!!! It's an electronic magazine. Download it on your computer, tablet, phone, grab your favorite beverage and peruse at your leisure. I like to sit with a fresh cup of coffee and read in one sitting (if my girls allow 😜). I personally need to see all the pattern details before I pick my projects so I can mentally start prepping fabric selection and time allowances. The early bird really does get the worm.... order by May 15th and get the early bird bonus! 25 articles and columns and 4 bonus tutorials! Gosh, there were so many helpful articles this time!! My favorites include the fabric stamping, scheduling social media, storing your digital patterns (which I need to sit down and make sure they are all backed up), pants fitting help, and IG analytics. I always enjoy reading the interviews too -- this issue, Holly from Top Knot Girl was interviewed -- she is so inspiring! The added tutorials are cute too! The key fob one is at the top of my list. The next time I am at Hobby Lobby, I will grab some key fob hardware to make my own. I also want to try the ice pack and covers. Oh my gosh, this blouse!! As soon as I saw Bobkin Designs had another pattern in this issue, I had to sew it. This is the Phillipa Blouse which features 2 different necklines - round or v-neck; 3 collars -round, angled or ruffled; 2 sleeve options - cap sleeve with bias or plain gathered sleeve, and a buttoned back. Instructions also include both regular and French seams. Because we are headed into Summer and it gets really hot here, I modified my version to be sleeveless and finished the arms off with hidden bias tape for a nice clean look. 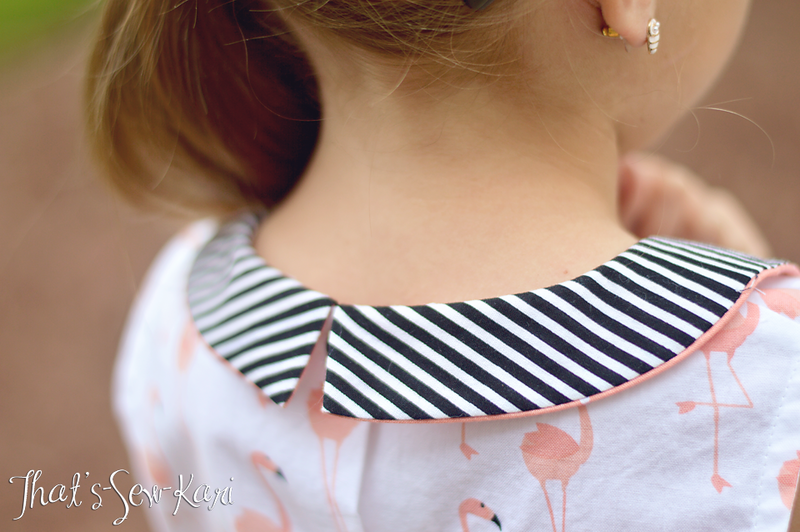 I also chose the angled collar for a slightly edgier look (it's gotta be cool for my 8 year old!) and carefully allowed a smidge of collar lining to peek out for a faux piping accent. 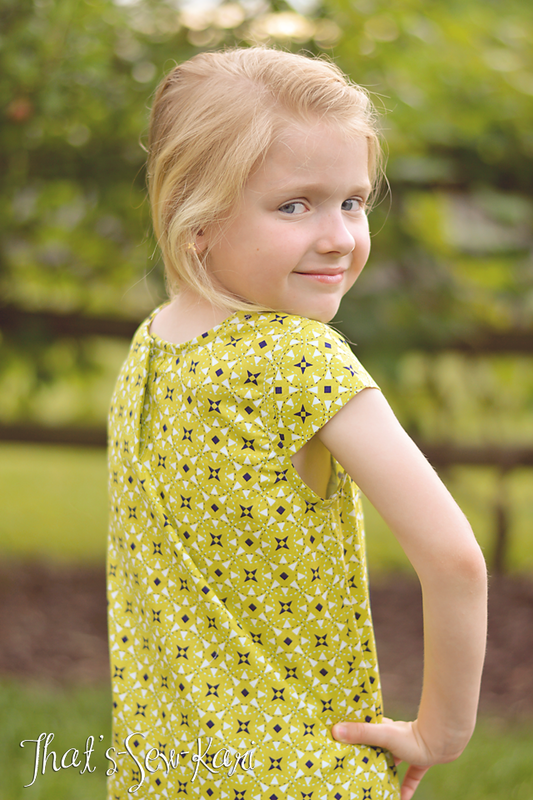 Bobkin patterns are expertly designed and seriously help you sew top-notch garments. There are pattern pieces for e-v-e-r-y-t-h-i-n-g so you are never going to miscut anything. Pattern pieces also contain notches for important steps, such as the collar above. All the guesswork has been taken out by Vanessa. I can't wait to sew more of these -- and try out the sleeves when it's Fall. 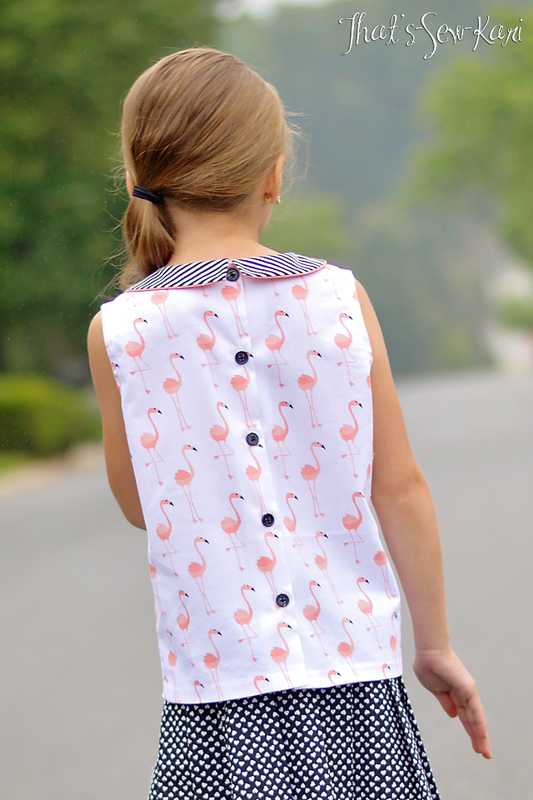 The back is fully buttoned and using the buttonhole guide made the buttons an easy 10-minute job. Of course, if buttonholes aren't your jam, Kam snaps can be used in lieu. This blouse is intended to have about 4" or so of ease, If you prefer a more fitted look, you can blend sizes. For my daughter, I blended sizes 3 (width) and 6 (height) after consulting with the sizing chart (which I already figured as she is a 3/6 blend in most designers). I did not size down in width -- this is the intended fit. 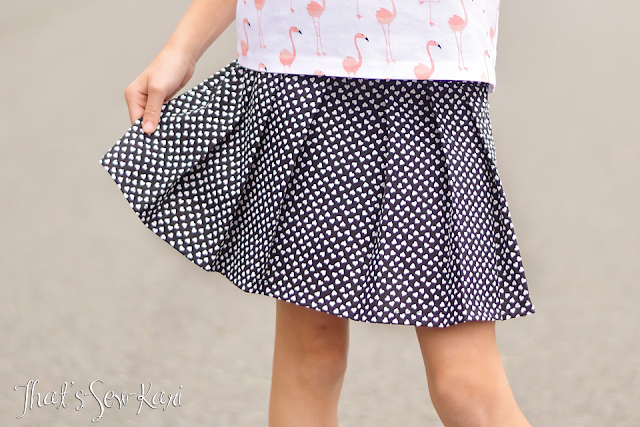 I am a SKIRT ADDICT so when I saw the Miriam Skirt by Once Upon a Sewing Machine, it went to the top of my list. This skirt features a tall, fitted waistband (which I of course, covered up... whoops) and a pleated skirt. A basic zipper is installed in the side seam and is enclosed in the lining for maximum comfort. The fit is spot on if you consult the measurement chart (after taking current measurements, of course). 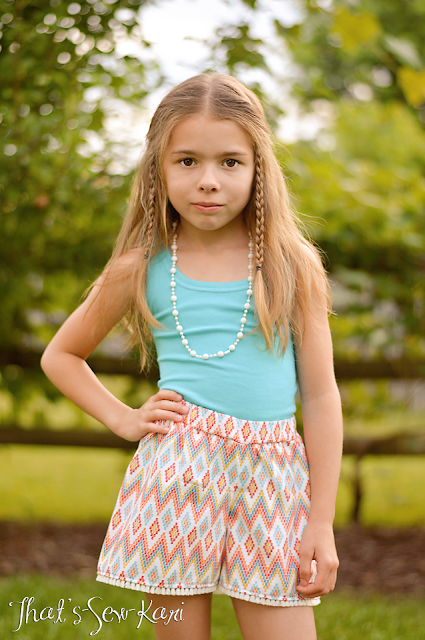 For my daughter's skirt, I blended sizes 2, 4, and 6. She has a size 2 waist, 4 hips, and a six height. It came together beautifully! I always try to sew a new-to-me designer each issue of OT. I am in LOVE with the results --- more skirts will be added to her wardrobe, for sure! Pick up your copy of OT Issue 15 here and if it's before May 15th, you'll get these bonus Hipster Props -- how fun!!! For more One Thimble Issue #15 inspiration and pattern reviews, check out the rest of the blogs on the tour! ➤ Love One Thimble so much?! 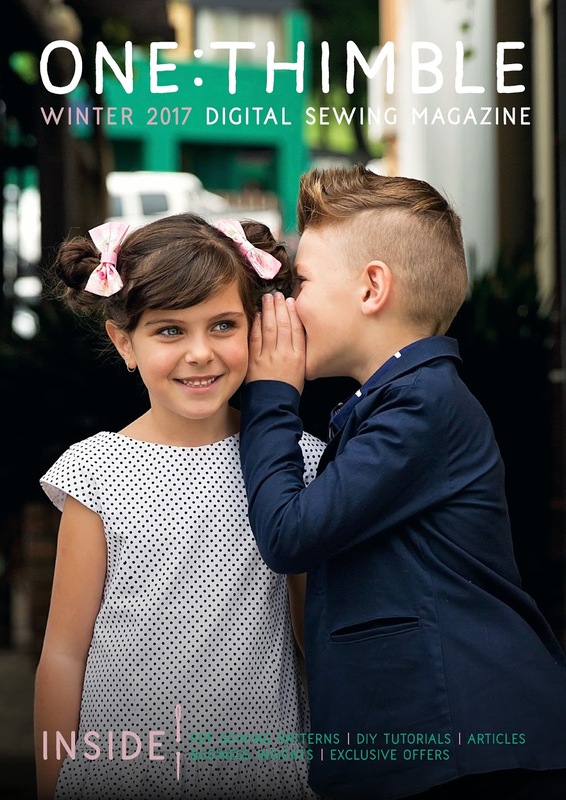 Grab a full year's worth (4 issues) for just $85 AUD (~$63 USD)!